1. 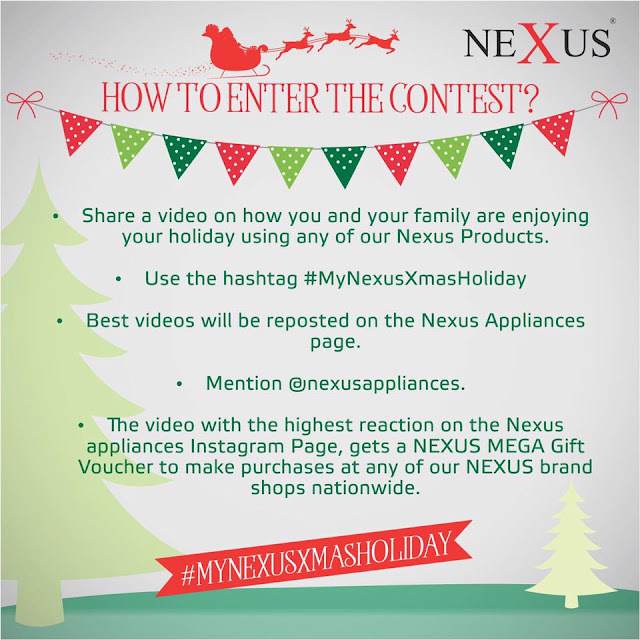 Share a Video on how you and your family are enjoying your holidays using any of our Nexus Products. 3. Best Videos will be posted on the Nexus Appliances Page. 5.The video with the highest reaction on the Nexus appliances Instagram Page, gets a Nexus Mega Gift Voucher to make purchases at any of our Nexus brand shops Nationwide. - Make sure your video entry is of good quality so it can be reposted. - Make sure at least one Nexus product is visible in your entry. - Goodluck! Let the contest begin. Follow @nexusappliances on Instagram to participate. Contest ends on the 4th of January,2018.